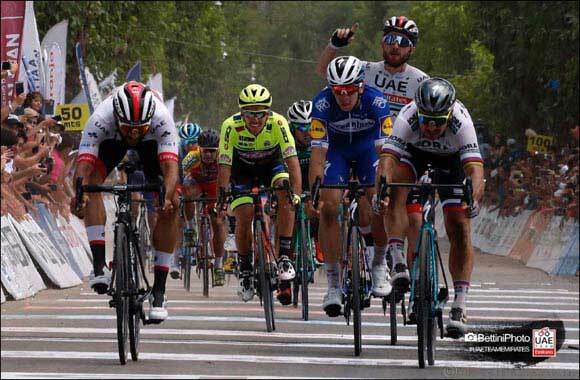 Dubai, UAE, January 31, 2019: In his second bunch sprint finish of the Vuelta a San Juan, UAE Team Emirates’ fast man Fernando Gaviria took a well-earned win, doubling his tally of 2019 victories after only four days of competitive racing. The Colombian sprinter continued his run of fine form, building on his opening stage success last Sunday. This time, the 24-year-old saw off three-time world champion Peter Sagan (Bora-Hansgrohe) to claim the honours and close the gap on the top spot in the race for the General Classification (GC). It was a gallant team effort, with Italian Simone Consonni providing the perfect lead out for Gaviria. As the bunch hit the 200 meter mark, a quartet of riders battled it out in a thrilling end to the fourth stage, with Consonni being rewarded for his hard graft by picking up a fourth place finish of his own. UAE Team Emirates continues to dominate the GC standings as it approaches the final three stages, with Fernando Gaviria in second place, Valerio Conti in third and Simone Consonni in seventh. UAE Team Emirates also maintains control of the team classification thanks to the riders’ individual positions as it looks to claim the second team classification win of the year, having already picked up the award at the Santos Tour Down Under.